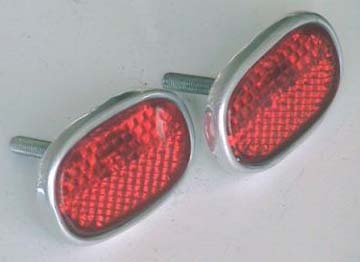 In the USA after mid-1959 all Mercedes-Benz Pontons (and both the 190SL [W121 II] and the 300SL [W198 II] roadsters) were required to have small red reflectors mounted inboard of each tail light and above the rear bumper. These are known as Ulonite 105 reflectors (000-544-14-05). Ulonite is still a major supplier to Daimler AG, but they are alleged to have lost the tools to make the No. 105. September 2014: New Ulonite No. 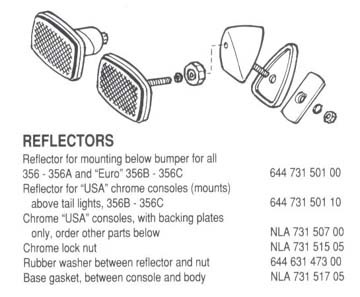 105 reflectors sell for $160, and the rubber mounts are about $55 (see Authentic Classics link). Given today's high value of the rare, New Old Stock (NOS), used, or even reconditioned Ulonite No. 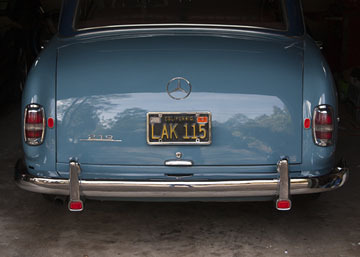 105 reflectors, it seems like a strong business case for Ulonite to tool-up, and make a batch run (including the rubber mounts) for distribution to the Mercedes-Benz Classic Centers, and after-market vendors around the world. Perhaps the economies of scale are not there – who knows? Ed. 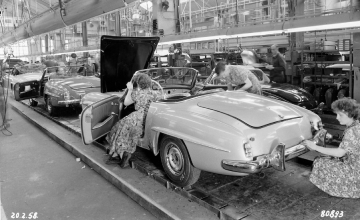 In Europe, both the 190SL roadster (W121 II — 5/55 - 2/63) and the 300SL roadster (W198 II — 8/57 - 2/63) used the Ulonite No. K1320 reflectors, which were slightly larger than the Ulonite 105. Note the Ulonite 135 (still available today) is a direct replacement for the ULO K1320. This is a rare NOS Ulonite 105 reflector. 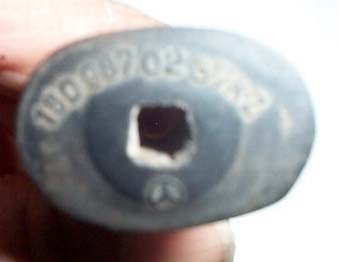 Original Mercedes-Benz part number 000-544-14-05. 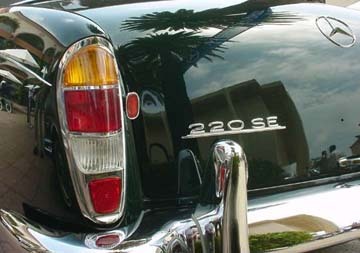 They were mounted vertically on the four and six cylinder Ponton sedans, coupés and cabriolets, and and horizontally on the Type 190SL and 300SL roadsters. 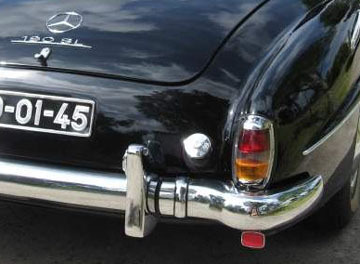 They were also used on certain post-Ponton Mercedes-Benz models such as the W110 (a.k.a. "Heckflosse" or "Fintail") Universal wagons. Robert was "on-the-lookout" for NOS Ulonites for almost 20 years! 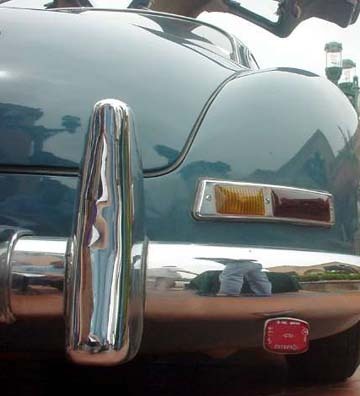 Ulonite 105 reflector on Mardy von Harten's 1958 Type 180D. 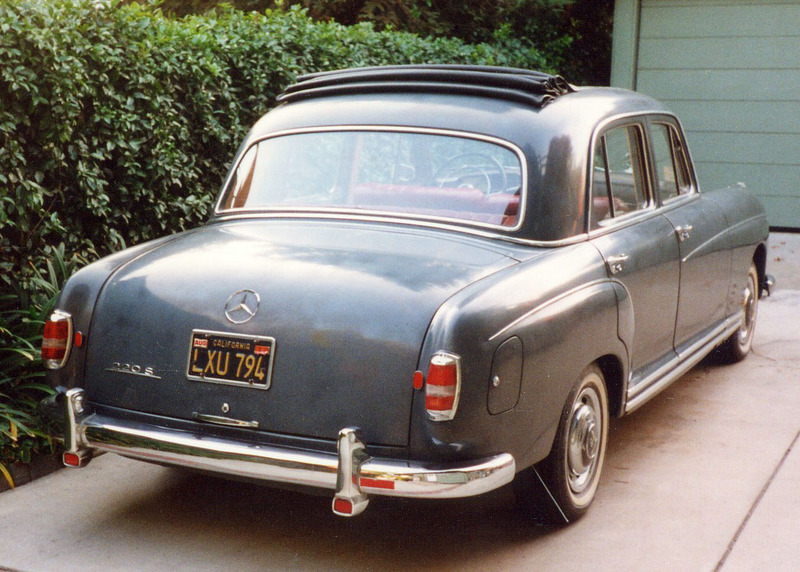 1959 Mercedes-Benz 220S sedan with Webasto sliding sunroof and Ulonite 105 reflectors. The bumper guards use the slightly larger Ulonite No. 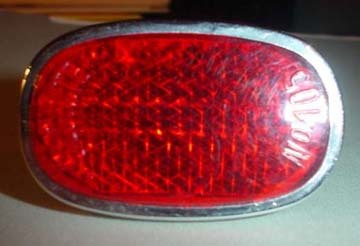 K1320 (or No.135) reflectors. 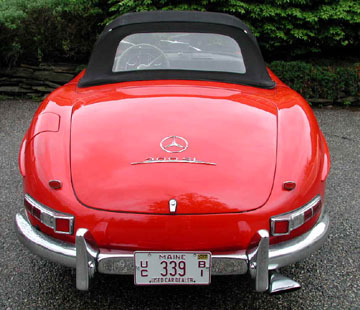 In the USA, the 190SL had reflectors mounted under the bumper until sometime in 1958 when the United States Department of Transportation (USDOT) got involved, and wanted them higher, thus the reflectors were moved to the tail panel — for USA cars only. 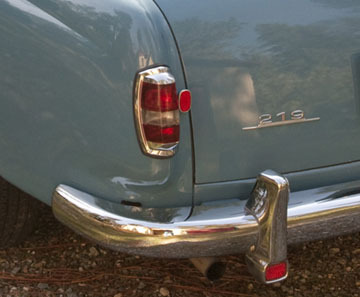 The correct mounting on the Type 190SL is horizontal, while the Ponton sedan, coupés and cabriolets were mounted vertically. 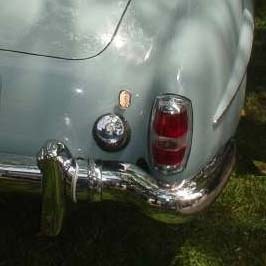 The 300SL roadster (W198 II — 8/57 - 2/63) also had Ulonite 105 reflectors mounted horizontally, but had a unique mount. Assembly line showing horizontal orientation of Ulonite 105 reflectors - destined for the USA market. 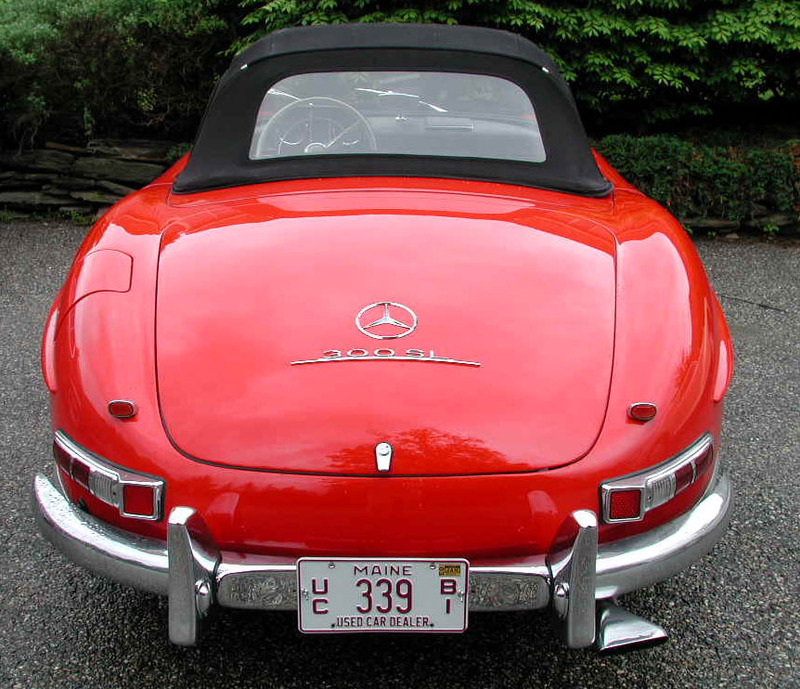 Click image to see larger version with 190SL with the larger Ulonite 135 reflectors mounted beneath the bumper. 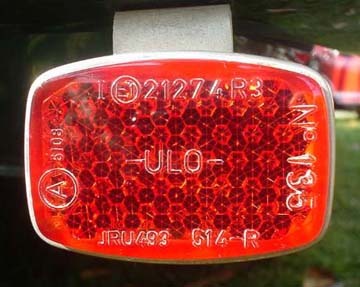 The car with the Ulonite 135 reflectors was destined for a market other than the USA. 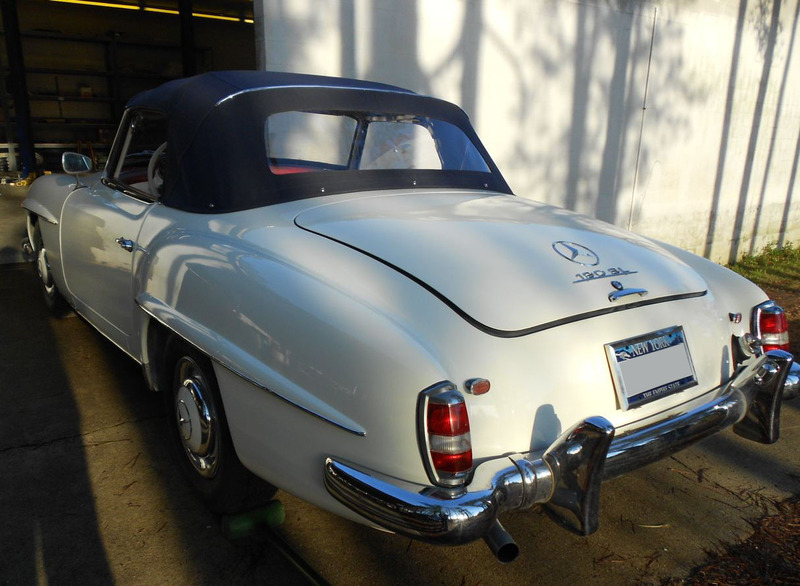 This 190SL has the Ulonite 105 reflectors mounted horizontally (correct) inboard of the tail lights. A sun-faded Ulonite 105 on a 190SL mounted vertically (incorrect). 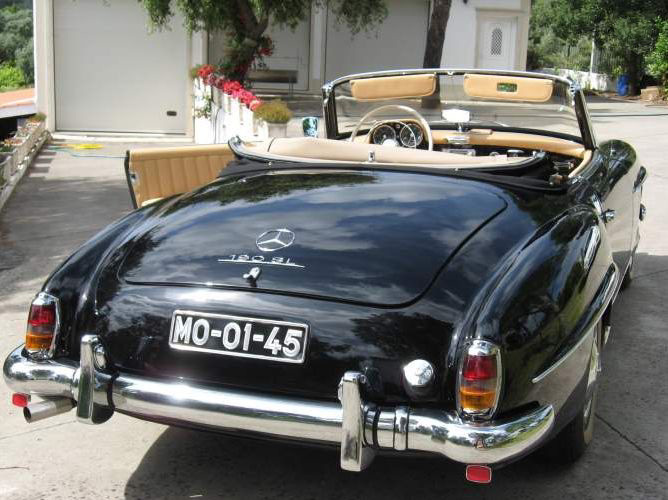 1962 Type 300SL (W198 II) roadster (8/57 - 2/63) with the Ulonite 105. Detail of the right side Ulonite No. 105 on the 1962 300SL (W198 II) roadster. 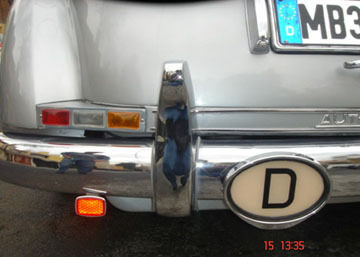 Type 300SL (W198 II) roadster (8/57 - 2/63) with the Ulonite 105.
with Ulonite K1320 reflectors mounted under the bumper. 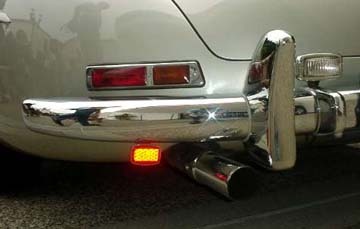 European specification Type 190SL with Ulonite K1320 reflector under the bumper. 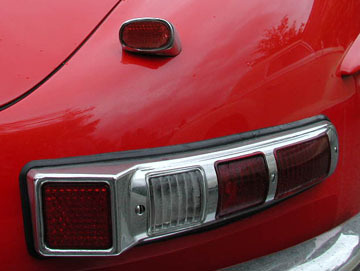 This early European specification (note amber turn signal lens) Type 190SL has Ulonite K1320 reflectors mounted below the bumper. Note the Ulonite 135 is a direct replacement for the ULO K1320. 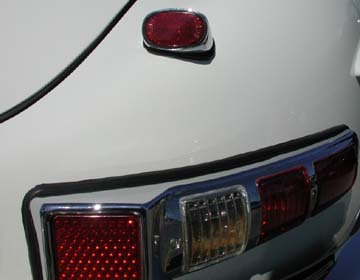 Later 190SL roadsters (in the USA market) had the Ulonite 105 reflectors mounted inboard (and horizontally) from the tail lamps. 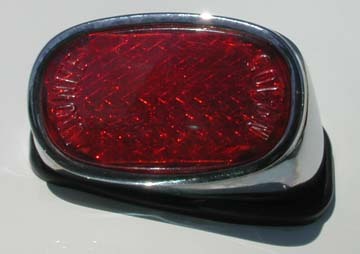 Note the Ulonite reflectors were originally made of glass and later changed to plastic. The European spec. 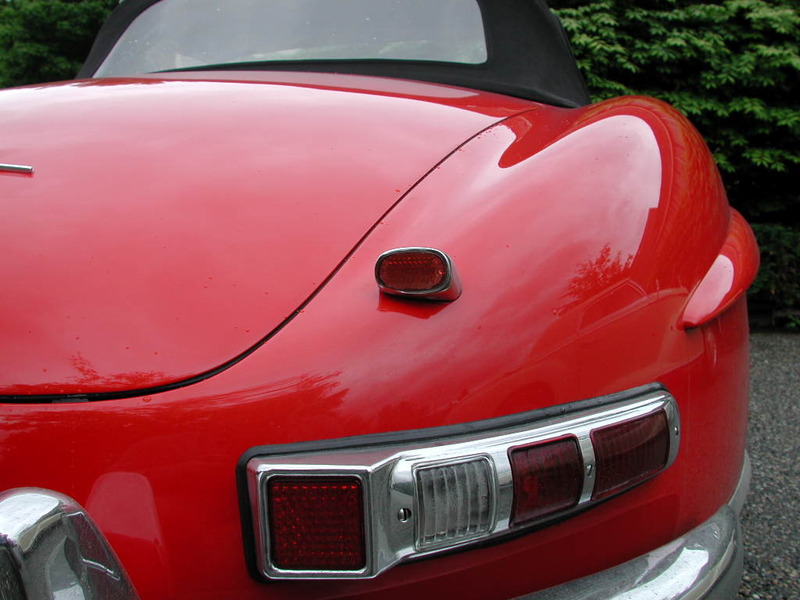 190SL roadsters have Ulonite K1320 reflectors mounted under the bumper as shown here. 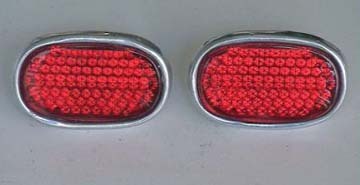 The K1320 reflectors are different than the USA spec. cars, and also different than the Ponton sedans, coupés, and cabriolets. Ulonite K1320 reflector on Type 300c "Adenauer"
The Ulonite 105 reflectors are no longer made and difficult to find in any condition. The slightly larger Ulonite 135 reflectors are readily available today (6/2002). The Ulonite 135 is used for different applications than the Ulonite 105 and so they are not interchangeable. Check the dimensions of your Mercedes-Benz Ponton Ulonite reflectors before contacting NLA Limited to be sure they will fit your car. The Mercedes-Benz 300SL "Gullwing" and Porsche 356 roadster both use the Ulonite No. 135. 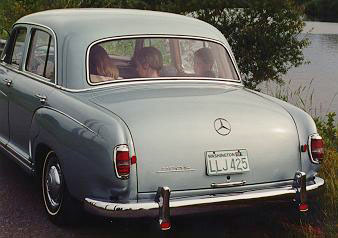 The four and six cylinder Mercedes-Benz Ponton sedans have rear bumper guards which also use the Ulonite No. 135 (up to about the middle of 1959). 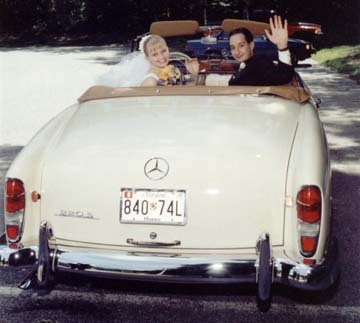 Certain Mercedes-Benz Type 190SL roadsters also use the Ulonite No. 135. See examples elsewhere on this page. Parts diagram for the Ulonite No. 135 (larger than the Ulonite No. 105). International Ponton Owners Group (IPOG) forum. 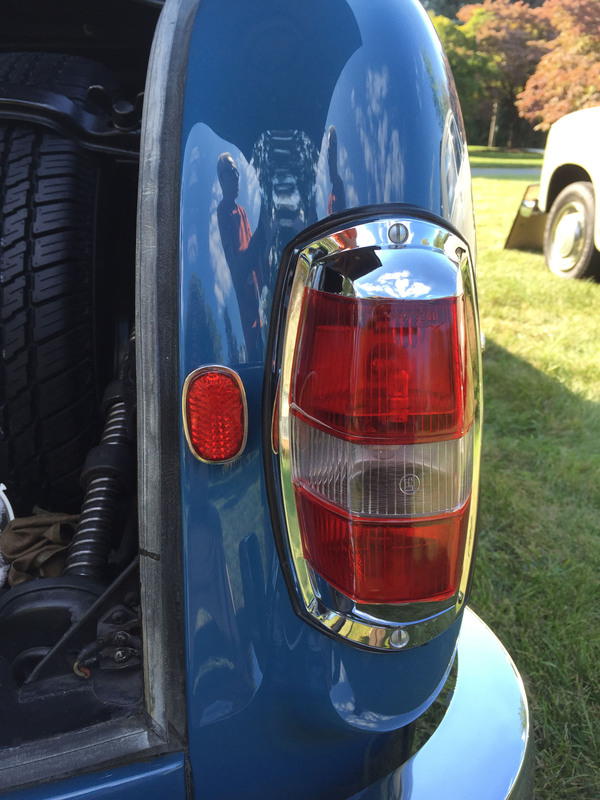 The reflectors themselves, including the threaded stud, are the same all around. The stud was slightly, but differently, angled on a couple of them, but after examination I concluded that this was the result of trauma and not an original feature. According to Werner Karasch in Germany, the original Mercedes-Benz part number for the Ulonite 105 reflectors was 000-544-14-05. The spacers are different front and rear, and left and right, on the cabriolet. For example, the left outside spacer goes only in that location. On the sedan, both outside spacers appear to be identical; one simply installs them reversed left versus right. Ditto the spacers inside the wheel well. I am not 100% certain about this, but it looked that way. I neglected to try to install them opposite the left or right side from which I removed them. If they are not identical left versus right, they are very close. The rear spacers on the sedan were more or less mirror images of the front spacers. They had a hole which the stud exited to receive a washer and nut. The inside spacers on the cabrio had a threaded tube molded into them. From inside the trunk one fits a screw into the threaded tube and somehow that turns onto the Ulonite's stud. Rather a peculiar arrangement, but I conclude that it was necessary because Uloniote 105s all came with the same length stud and the cabrio's distance for mounting it was rather longer than the sedan's. 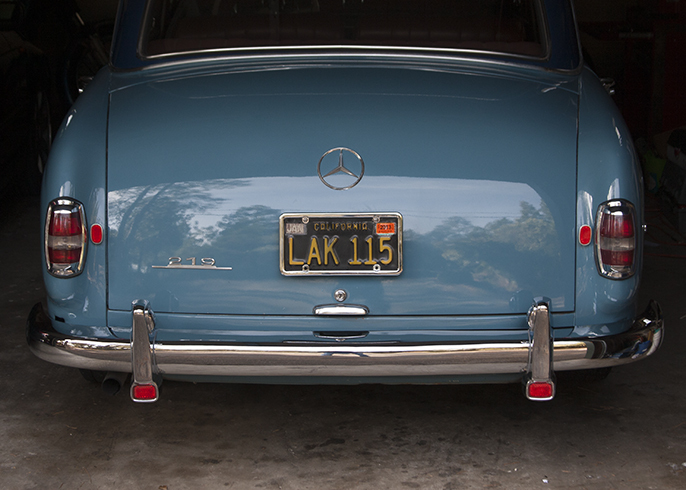 All spacers originally had Mercedes-Benz part numbers marked on them. On all mine, however, they were so worn as to be unreadable. I did see enough on the cabrio's spacers probably to confirm the numbers that Jack Kotrba provided. There is no way, repeat no way, the cabrio Ulonite spacers would have fit on a 190SL. The coupé/cabriolet mounting angles are way too sharp. 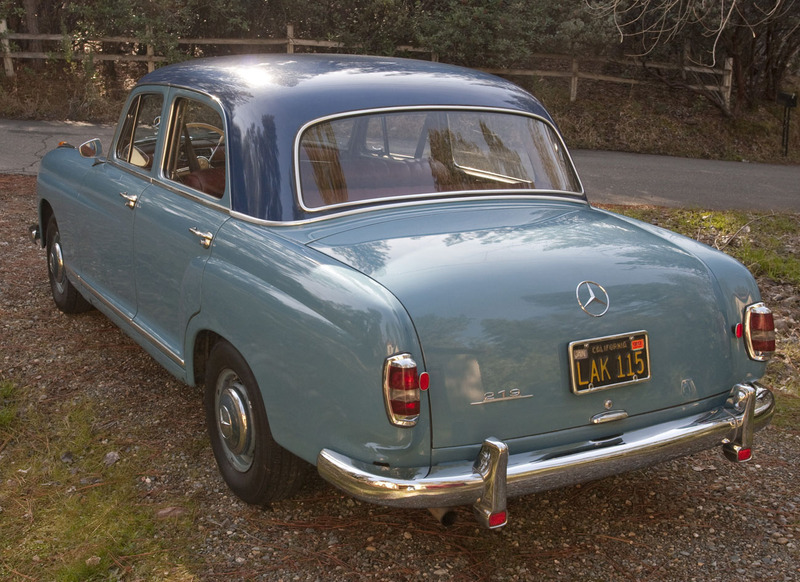 As I have not examined a 190SL yet, however, I cannot comment as to whether the sedan spacers also fit them. I shall have to determine this another time. 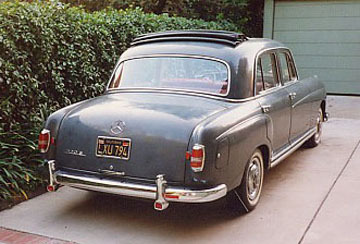 Exactly when the Ulonite 105 began to be fitted to USA-specification Mercedes-Benz Ponton sedans, coupés, and cabriolets is still a subject of conjecture. 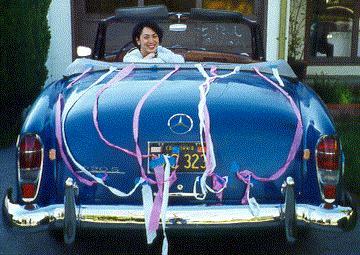 I did read, however, in the September 1992 issue of the Mercedes Collector (No. 4), F. Mallory, ed. 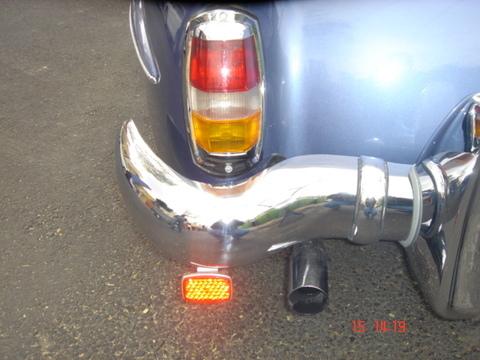 where Ron Rapp wrote at p. 26 that the reflectors were moved from under the bumper to the body in December 1957 on the Type 190SL with USA specifications. 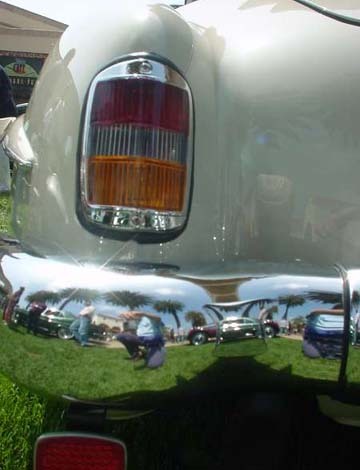 One may reasonably infer, therefore, that the reflectors went on USA-specification Ponton sedans, coupés, and cabrios at the same time. Still, I have not found anything conclusive or determinative." I do not know if the black mounting tube came as an integral feature of the Ulonite 105 or whether it was supplied separately from the reflector itself. I can say from observation that the tubes differ on sedans versus coupés/cabrios. 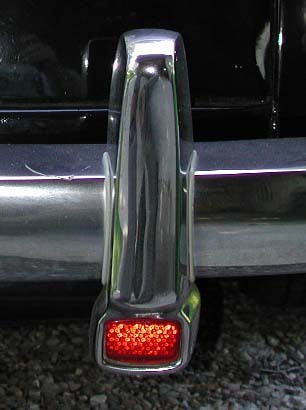 In addition, the mounting angle (the cut along the mounting end) of the black tube differed on the sedan versus coupé/cabrio. 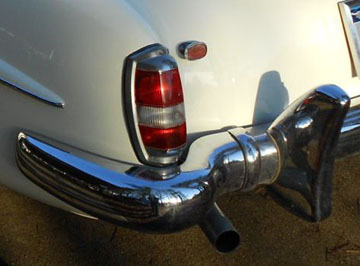 Finally, the coupé/cabrio mounting tube is much longer than on the sedan and is not split into two sections. 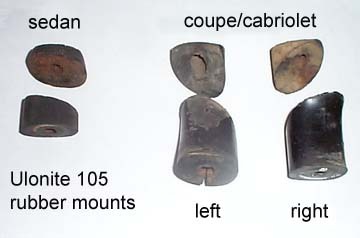 Ulonite rubber mounts for Mercedes-Benz Ponton coupés and cabriolets. There were no letters after the left side numbers. I think all the sedans use the same pieces. These pieces go on either side of the body sheet metal with the stud from the Ulonite going through both to fasten it on.